Our day began with a train ride from the Amsterdam Shiphol Airport to Amsterdam Central Station. The train from Amsterdam Shiphol Airport departs from platforms 1 and 2. We found this not easily marked and were a bit confused. After boarding the train the travel time to Amsterdam was about 20 minutes. Our train stopped at two other stations along the route; Amsterdam Lelylaan and Amsterdam Sloterdijk. The final stop was Amsterdam Central which is the main station in the heart of the city. A train inspector did come by to verify tickets so make sure you purchase prior to boarding the train. We bought ours in advance, good for our date of travel, at TicketBar for 10.80 Euro round trip. Otherwise you can purchase directly at the Amsterdam Shiphol Airport automated ticket machines. 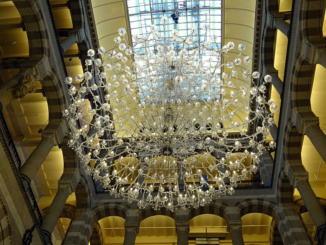 Our hotel was the Park Plaza Victoria Amsterdam which is directly across the street from Amsterdam Central Station. This makes it easy to travel about the city as the train, metro, tram and bus services are all easily accessible. In fact, we noticed that all the main tram routes begin at Amsterdam Central Station. We were also just five minutes’ walk from the Tours & Tickets office at Damrak 26 where several of our tours were leaving from. Upon arrival at the hotel about 9am, our room was not yet ready. We find this customary all throughout Europe. If your check-in time is 2pm, your room will probably not be available until 2pm. We did leave our luggage with the Hotel Porter who locked it safely away and provided us a receipt. With the inability to catch a quick nap, we quickly were out and about the city. We boarded Tram 4 at Amsterdam Central Station and quickly headed for the Bloemenmarkt (a floating flower market) at Muntplein and Koningsplein. Because we were unfamiliar with the general area we simply asked the tram driver to alert us when to get off. We purchased a single ride pass for 2.50 Euro. Our ride from Amsterdam Central Station took about 10 minutes then we were afoot at the Bloemenmarkt along the Singel Canal. We first stepped into the Amarylles Lunchroom at Singel 540. Here we had a wonderful breakfast of scrambled eggs, Canadian bacon, beans, and toast with jam all topped off with hot tea. Afterwards we wondered about the Bloemenmarkt billed as the world’s only floating flower market. Somehow, I thought the flowers would be floating, but instead it is the shops that sit (or float) in a stationary manner on the canal. It was an ah-ha moment for me. Basically, this is a large area filled with shop after shop of bulbs, flowers, and trinkets of all kinds. It that type of thing is to your liking, make sure to pay a visit next time you are in Amsterdam. Upon our return to Central Amsterdam, we had a lunch time bite at the Golden Age Cheese Store. We simply love the pocket cheese sandwich called Kasasenvelop at 3 Euro. You can also book a 1-hour cheese tasting experience here for 20 Euro complete with Wine and Fig Bread. 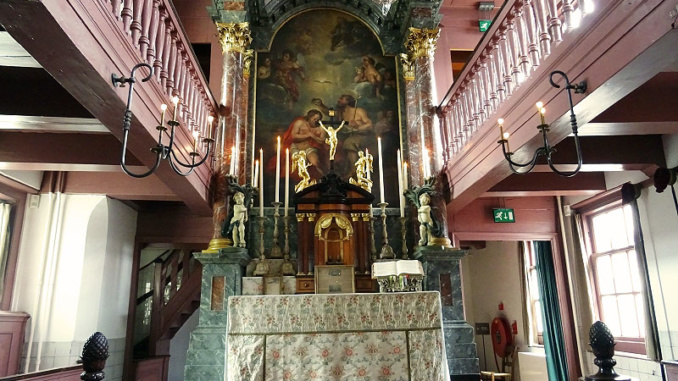 We then headed on foot over to Oudezijds Voorburgwal 38-49 to pay a visit to Our Lord in the Attic. This was an easy 5-minute walk. Built in 1663, the attics of three row houses were combined to make a hidden from sight church. At that time in Amsterdam’s history, public Catholic worship was forbidden. We arrived in the afternoon, and without much signage to indicate where the hidden church was located, stumbled upon it just by the address. Adult entry was 10 Euro which included the audio guide available in Dutch, English, French, German, Spanish, Italian and Russian. I would say this exhibit was carefully thought out with the audio guide and order of events about as perfect as you will ever get. We began with a short history presentation in the basement then headed through each level one by one. The rooms and order of visit were: Grand Parlor, 19th Century Kitchen, Chaplain’s Room, Leeuwenberg room, Canal room, Confessional, 17th Century Kitchen, and at the top was the Church in the Attic. On the way out there were a few other areas to view, followed by several exhibitions in the museum. The whole tour took about an hour and a half with the majority of time spent admiring the amazing hidden church. This is a must visit attraction when in Amsterdam. After our visit we headed to Dam Square where a carnival was setup in advance of the Kings Day celebration. There were some thrilling rides for the daredevils in the crowd. We took the opportunity to ride through an old-style, sit down fun-house and later in the evening rode The View which is a super-sized Ferris wheel. The top of the Ferris wheel became the highest point in the City. We were presented with amazing night-time views and a great photo opportunity. We topped off the night with some Spanish churros before retiring to the Park Plaza Victoria for the evening. Upon arrival at the Park Plaza Victoria Amsterdam, we were treated to a Junior Suite; Room 477; which was quite spacious. This certainly made up for the long wait to get into our room.